There is often construction to puncture the wall and the concrete of the house in the air conditioner construction and electrical work in the appliance dealer. It is used that the performance is good for the drill, and it doesn't use and efficiency and the finish of work are the fairly different one. It thought about the hammer drill from my longtime experience. What is the hammer drill (vibration drill)? The hammer drill is a drill to give the vibration of the back and forth to a drill blade with the rotation to raise the perforation efficiency when puncturing it hard like concrete. It is understood that the hole doesn't open at all if there are neither a vibration nor beaten operation. However, the object such as walls might break when the beaten operation is too strong. 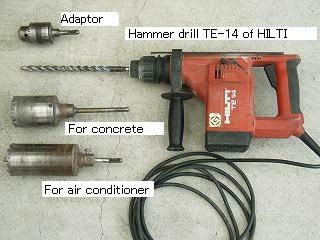 This photograph is hammer drill TE-14 of HILTI (Principality of Liechtenstein) that I am using. I mostly use TE-14 for the air conditioner though I own TE-22 that is a little more large-scale than this model. The performance is preeminent though the price of the product of HILTI is high. There shall not be a reactionary (no reactionary) that it is the most excellent compared with the other companies. Moreover, the trademark of HILTI is a red main body and red case. The zipper on the left of the photograph is the one using it when the blade of a usual drill is used. This cannot be used as a hammer drill. The joint of the zipper cracks if the vibration is used putting it. When the wall is the one used for the perforation for the installation of the air conditioner, and is concrete and a concrete block, the core drill at the center of the left is used. The perforation can be done dry and easily though it is not a diamond drill. The core drill under that is used for perforations such as the wall, the clay walls, and the siding walls of the Ruth putting wooden. Generally, it is possible to use it for everything. Prices are higher than the other companies. A drill main body is never brandished even if a drill bit is no reactionary caught to something and it stops suddenly. You can hardly press the drill of HILTI though it is necessary to press the drill against the wall in the perforation in the hammer drill and the vibration drill of the other companies. Only shock and rotation + rotation can be switched. The rotational speed can be adjusted to a no stage. The method of installing a drill bit of HILTI can be installed one-touch by the peculiar method that is called SDS or SDS plus. As for a concrete bit, the perforation is possible in the stone. I have never broken down though I use the hammer drill of HILTI for years. However, it is necessary to maintain it. It is necessary to sometimes oil it to the part where the SDS bit is installed. The movement of the back and forth worsens if it doesn't oil it at all, and the hammer doesn't work. It is likely to come to have to press it against the wall strongly. Of course, the cleaning of each part after it uses it is necessary. However, use seems also to have little thing that breaks down.